I still have the problem of forex trading by emotion. Eventhough I already decided that I will follow my own trading strategy. My emotions still get the best of me. And because of that, I fail to recognize signals that will lead to profit. Here are some signals that I’ve been waiting all day, yet failed to take them because I’m too focused on trading too much and not waiting for the perfect setup. 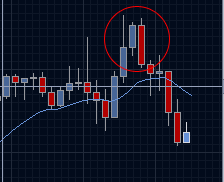 An inside bar formed after a trend can only signal a reverse of the trend. BUT, if an inside bar was formed and the confirming (next bar) failed, then the trend will continue. This doesn’t look like the traditional reversal pin bar right? But its actually a reversal pin bar when you look into longer charts. 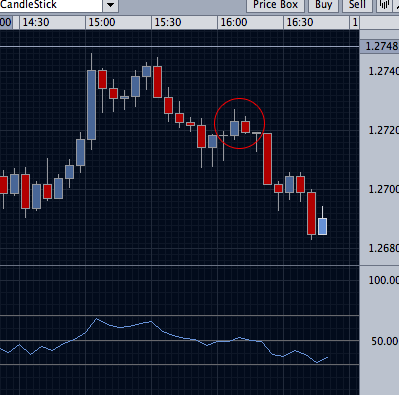 The bars that formed that are almost identical in height signifies that bulls and bears where reversed but 2 bars apart. The confirmation signal should give you a go if you should enter. In which I failed. I also think that the doji after the confirmation bar makes it even stronger. When it means that the bulls failed to take over the market. Hence, the bears won the trend. I’m a little frustrated with today’s trade. I seem to be a little distracted and focused on making money instead of waiting for the setup to present itself.